July, 2005 was a turning point in Shelley’s life. Until then, she had difficulty getting along with her friends, co-workers and staff. While she desired to improve these relationships, she seemed to struggle in finding a way. Enter Occupational Therapy. 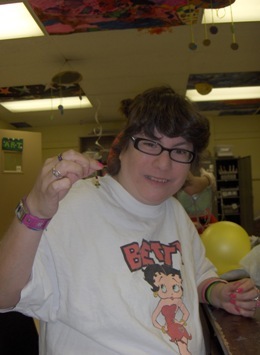 The Certified Occupational Therapy Assistant (COTA) at DSC evaluated Shelley and assisted her in setting goals that would help her feel better about herself through increasing her skills and choices for living her life. April is Occupational Therapy month, a science that enables people of all ages live life to its fullest by helping them promote health, prevent, or live better with, injury, illness or disability. It is a practice deeply rooted in science and is evidence-based, meaning that the plan designed for each individual is supported by data, experience, and “best practices” that have been developed and proven over time. When working with an occupational therapy practitioner, strategies and modifications are customized for each individual to resolve problems, improve function and support everyday living activities. The goal is to maximize potential. Through these therapeutic approaches, occupational therapy helps individuals design their lives, develop needed skills, adjust their environments (e.g. home, school or work) and build health-promoting habit and routines that will allow them to thrive. As a part of Shelley’s day, she also spends time working on contracts that DSC has with Advanced Filtration Systems, Inc., which allows her to earn income and have choices on how she spends her money; furthermore, Shelley has caught the entrepreneurial spirit as she has recently launched a successful personal business, Beads by Shelley, where she is making colored glass bead earrings. Shelley enjoys jewelry herself, so she has combined something she enjoys with the opportunity to increase her income…a winning combination. During the holiday months, Shelley utilizes her cooking skills and makes pizzas, in which she sells by the slice to staff at DSC. With the proceeds from these sales, Shelley takes an Angel from the Angel Tree at Marketview Shopping Center and purchases a Christmas gift for a young girl. Since Shelley is up on all the hottest trends, she purchases items that she knows will be a hit on Christmas morning. When asked how Occupational Therapy has made a difference in her life, Shelley replies, “I am happy and proud of myself. I like when people purchase things I make. I used to be grouchy, but I am not anymore.” Seeing Shelley, one will immediately notice her fancy rings, watch and cute purses as a signature of who Shelley is, what she likes and how she chooses to live her life! DSC has two Certified Occupational Therapy Assistants (COTA) on staff to carry out the programs as designed in support with an independent Occupational Therapist. Through the support of COTA’s, DSC furthers our mission of enhancing the lives of people with disabilities by providing services and supports which enable them to live, work, learn and participate in their communities.